Follow US 395 to Highway 120 (Tioga Pass Road)*, and follow to Tioga Lake. *Note: Subject to seasonal closures due to snow/ice. Snow-capped Mammoth Peak and the Kuna Crest reflect in the calm, icy water of Tioga Lake near the east entrance of Yosemite National Park during sunset. Yosemite has a variety of elevations. Although Yosemite Valley is approximately 4,000 feet, the "high country" of Yosemite goes to 10,000 feet and higher (Mount Lyell is more than 13,000 feet!). 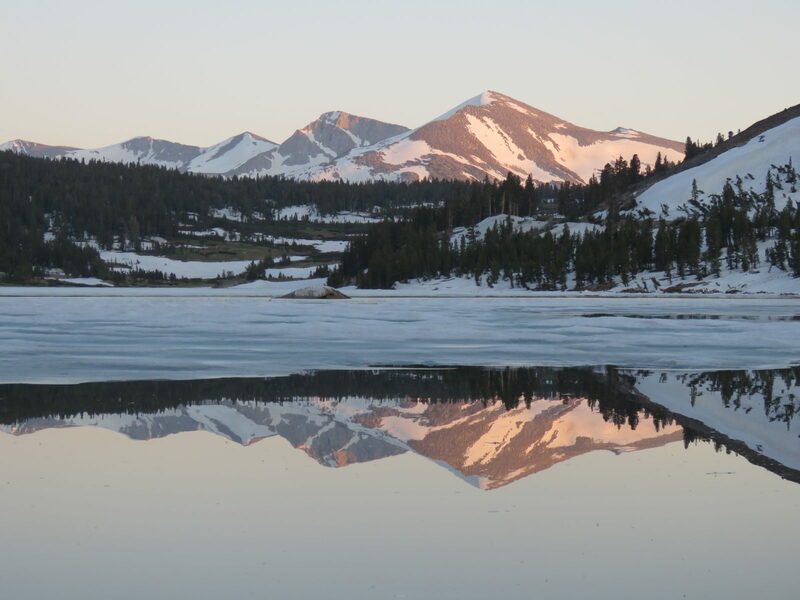 Tioga Lake is around 10,000 feet in elevation, so remains snowy and icy for a good portion of the year.